- Delivery: The Master Lock 878LH Combination Padlock is in stock and available to ship. The Master Lock No. 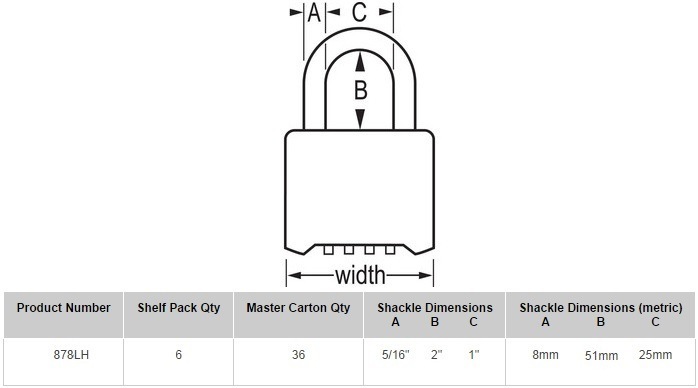 878LH Resettable Combination Padlock features a 2" (51mm) wide powder coated black zinc body for durable security and weatherability and a 2" (51mm) tall, 5/16" (8mm) diameter hardened steel shackle for excellent cut resistance. Dual deadlocking protects against prying, shimming and rap attacks and a shackle seal protects components for trouble-free operation. The 4-digit dials allow you to set-your-own combination and reset to restrict/change allowed access without a combination reset tool. - 2" (51mm) powder coated black zinc body for durable security and weatherability.